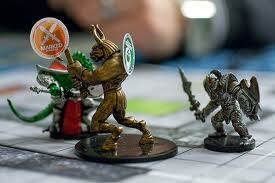 I promise things will get videogamey again, but D&D is on the brain. Wizards of the Coast have put out various sets of miniatures over the years so you can visualize your characters and the creatures the game pits against you. I've bought some, but not many because I hate that they're randomized. They add a lot to the game, so it kind of infuriates me that you can't just buy the minis you need for a particular adventure. Looking into the reasons why, it sounds like painted minis are more costly, and selling singles in problematic, and there is also the concern of which minis local game stores keep in stock. I wonder if they could release them unpainted, in big sets based on a level range, in a big plastic bag that makes my inner-child drool. But since that doesn't exist, I was looking into other ways to accurately represent monsters on the board. Paper or cardboard cutouts was an option, but they seem to flimsy and fiddly. Punching out monster portraits and pasting them onto washers was a possibility, but it didn't seem as convenient for larger enemies, especially since square bases seem better for large figures. Pasting it onto chipboard was another idea, but again, finding the perfect bits seemed like a pain, and I started asking myself, do I really want to have an arts and crafts session before every game? 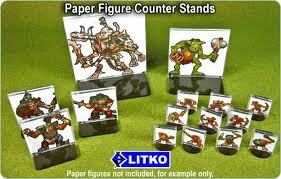 An interesting compromise popped up with these Litko Paper Counter Stands. They are all nicely conformed to mini size standards, but let you print out square enemy portraits and just slip them in for your adventure that night. Jen was nice enough to pick them up as an early birthday gift. I hope I like them!